See how easy it is to learn how to make your very own exquisite dragonfly, with wings so real they look ready to fly! This shimmering emerald green dragonfly rests near a floating bed of lovely silk overdyed waterlilies on a gorgeous bed of whitework! Beautifully highlighted with shimmering beads and gold pearls… it really takes your breath away! Stumpwork is all the rage, and this design makes it easy! It is suitable for intermediate specialty stitchers who are familiar with charts and diagrams of counted thread work on linen. You will also explore Basic Hardanger techniques like Kloster Blocks, Algerian Eye, Weaving, Dove’s Eyes, Greek Crosses, and also more intermediate techniques like Four sided Pulled Stitches and Double Herringbone Drawn Thread work. 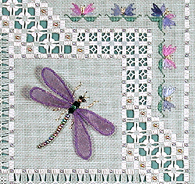 You will learn to build the Stumpwork Dragonfly step by step and you can see for yourself how easy it is to make and attach the wings. Some of you may recognize this design in other colours in the Dragonfly Lace Cyberclass online, but to show you how, I’ve changed the colours of the dragonfly wings, the body, and the water lilies to create a whole new look for this design! I’ve also framed it with rich colours to emphasize the jewel like nature of the new colours. Feel free to sign up for the Cyberclass if you’d like extra help, and come and join us to learn to make this elegant and timeless keepsake for yourself! Happy Stitching ! Model: 32ct Flax Belfast Linen: 4.5" wide x 4.5" high. 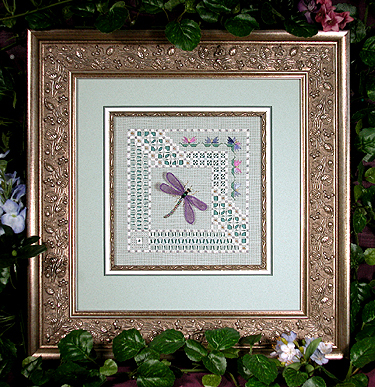 ACCESSORY PACK: Ask for the Dragonfly Lace Sampler accessory pack at participating needlework shops. This pack contains plenty of threads and materials to complete the sampler!